The unanimous candidate for International and Alumni Relations Secretary Dhruv Himanshu Jain is a fourth-year dual degree student from the Department of Civil Engineering. The candidate started out with briefing the audience on his vision regarding the International and Alumni Relations Student Council. 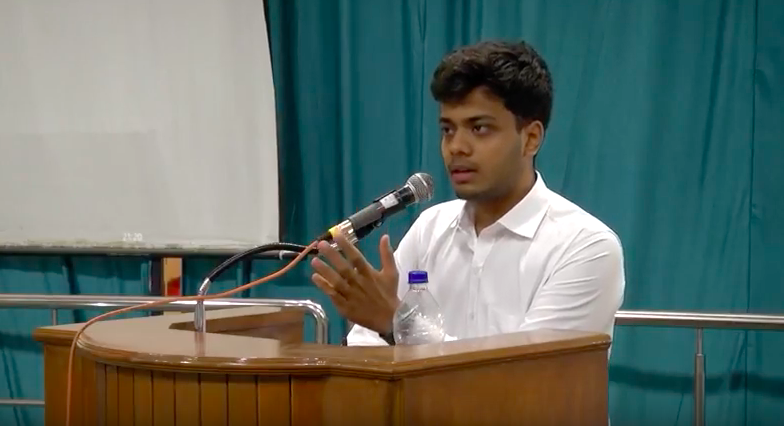 Dhruv talked about instilling pride among students, faculty and alumni by establishing brand IIT Madras, creating a synergy between all teams of IAR Student Council and cordial relations with other institute bodies and bringing alumni closer to students through common interests by providing necessary platforms. Dhruv stressed on facilitating skill assessment tests for students in their early institute life and creating an application guidebook for higher studies in non-core fields. He cited the example of CFI and the tech culture of the institute and said that he wants to establish a Business Club bringing the existing Finance and Consulting clubs under its umbrella to create a culture for the same in the institute. He also wants the Career Development Cell to compile a list of various national and international competitions and leadership conferences for students. Dhruv promised to kickstart the Alumni Mentorship Programme for Students (AMPS) and said that response from both student and alumni side has been overwhelming. He said that while they would manually map mentors for now, they would also look into the possibility of having an algorithm for the same in the future. The candidate also talked about setting up Special Interest Groups (SIGs) among alumni community in order to streamline the approach based on sectors and interests. He wants to organise webinars by alumni on experiences in unconventional careers, international universities and specific companies. Dhruv said that his vision is to considerably improve the public perception of IIT Madras, a significant metric in university rankings where we lag behind. This would be done through creating a campus video, showcasing various opportunities offered by different departments and by launching a heritage series. Dhruv said that he wants to realign IITM TV’s focus from creative content generation to institute specific content and as a platform to publish content from teams under other secretaries as well. He also wants to revive the research corner showcasing the cutting edge research happening on campus. Dhruv wishes to revive Insti Spice, organise country meets and create awareness about international opportunities so that seats do not go vacant. The Q&A session was opened by the outgoing I&AR secretary Vineesha Badabhagni, who asked for new initiatives which will be undertaken to improve the branding of IIT Madras. In response to this, Dhruv stated that he would take up the production of a campus video, which was not done until now due to a lack of time/expertise on the part of IITM TV. To remedy this, he said, he would outsource it to third-party vendors. The second initiative was to highlight the unique aspects of each department, using a video. This too, he said could be outsourced. When inquired about restructuring Peepal Pol it’s similarities with the existing Media Club, Dhruv replied by saying that the bodies under Peepal Pol (IITM TV, Pod, da! and Bioscope Factory) were created for different purposes. While IITM TV was originally intended as a branding tool for IAR, in the recent years, they tried putting out creative content. IITM TV would be more focused on institute specific content, and content from other secretaries’ would also be considered, and said that it would be done after discussion with all the upcoming secretaries. On a question on Pod, da! from SECC Chair, YVV Aditya, he responded saying that while he wants Pod, da! to focus more on producing audio content, its Facebook page has a target audience who look for satire and that it cannot be stopped immediately so it needs to be phased out. He said that Bioscope Factory would work closely with the Media Club to ensure collaboration and synergy. Vineesha then asked the candidate if he would be taking in a webops team to which he replied in negative saying that if a need for the same comes up, they would get it done on a contract basis rather than hiring a permanent team for the same. She ended by questioning him about AMPS, Dhruv replied by saying that while mapping is not possible for all students simultaneously, he hopes to map a few students each week, and hopes to have an algorithm in place to do the mapping for the next year. When SLC Speaker, Namburi Nikhil Bharadwaj pointed out that Pod, da!’s editorial policy mentioned that its founding members were part of its admin panel, the candidate assured that no alumni would be part of Pod, da!’s admin team. Students General Secretary Sai Kiran G L questioned the candidate on the discontinuation of the Hostel Manager position. Dhruv replied that there was not enough work and that the Alumni Relations Cell is well equipped to take care of it on its own and the other duties of the Alumni Affairs Secretary (scrapped and replaced by Hostel Manager position) can be divided among other hostel secretaries. When asked who was consulted to scrap the position of Hostel Manager, he said that a lack of applicants and a lack of work led to the decision. On the issues of financial transparency and accountability to the GSB, Sai Kiran noted the gap between I&AR and other secretaries, as other secretaries base their activities on Gymkhana funds unlike the I&AR Secretary. The SLC Speaker Nikhil added to that, saying the I&AR Student Council had not presented its budget to SLC for the last 5 years and argued that it needed to be held more accountable to the GSB. I&AR Secretary Vineesha responded saying that all the financial records have been maintained and she had already asked the standing committee on I&AR to collect it for the purpose of scrutinizing. Responding to Nikhil’s question on student opinion not figuring in the associations and discount deals, Dhruv said that an smail google form in advance would not work in this case but they would try to collect student feedback and will share data on how many students had taken the benefits. The outgoing Research Affairs Secretary Ashok Kumar asked if a research buddy program for PG students was feasible to which Dhruv responded in positive. On a question on Joint Degree Programme, he said that I&AR student council was not involved in the signing of the MoUs but they would definitely work towards raising awareness about the joint degree programmes among the research scholars. The outgoing RAS also asked if alumni funding could be leveraged for research groups. The candidate replied that while it was possible, it was very difficult to get. since funding was usually done by alumni with particular interests, and finding an alumnus with interests aligned in the direction of the research group would be difficult. However, he assured that the IAR team would offer its complete support in any endeavour undertaken in this regard by the RAS. On the last question from a GSB member on synergy between Alumni Outreach Cell and Placement Team, the candidate responded that it was already happening, albeit through IITMAA. He said that he would make it a point to pitch placements to alumni from companies which are not coming to our campus but are going to other IITs. With no more questions from GSB, the moderator dissolved the session concluding the final soapbox of Day 1.